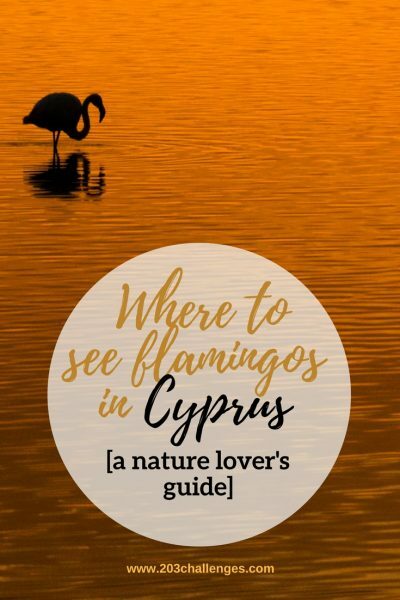 While researching what to see and do in and around Larnaca, Cyprus, I came across the exciting information that flamingos fly over to this Mediterranean island for the winter. 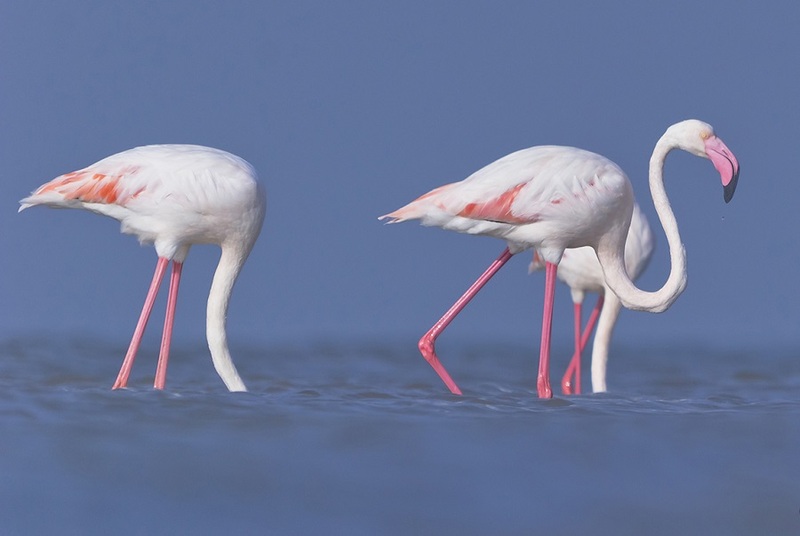 As a dweller of a non-flamingo country, I felt my pulse skyrocket, and leggy pink birds turned into the main theme of my trip to Cyprus. 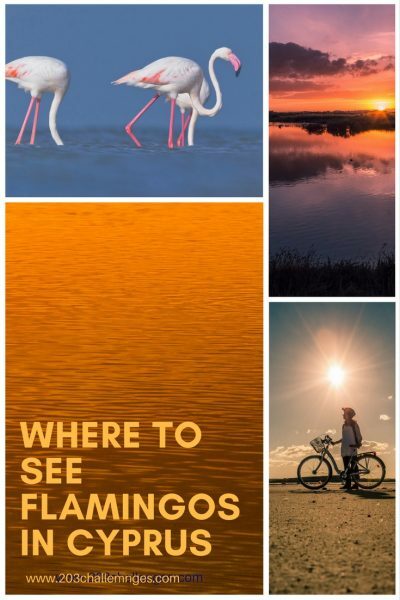 Here’s a quick guide on how to see greater flamingos in Cyprus, along with some other useful information and interesting facts. Larnaca Salt Lake is located just off the main road to Larnaca Airport and is easily accessible from the city through a beautiful park area. There are paths, benches, and observation decks following the lake’s banks. Bring a packed lunch and enjoy the sun and the views. 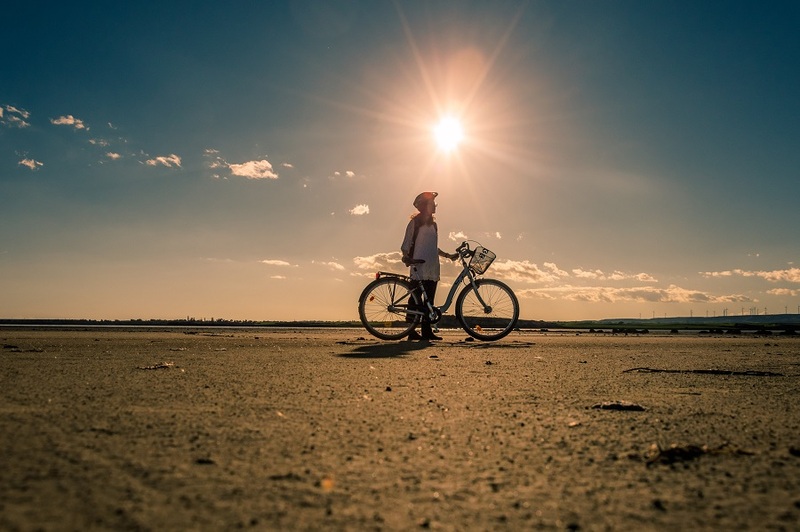 How to make it better: Hire bikes from the beach and ride to the lake through the beautiful Patticheio Park. Don’t ride too close to the lake – the mud is extremely sticky and you’ll have a lot of trouble cleaning your bike (as I did!). Fun fact: Once, the salt obtained from the lake was one of the major exports of Cyrpus. It used to be carried by donkeys and piled in enormous heaps on the banks of the lake until the end of the 1980s. 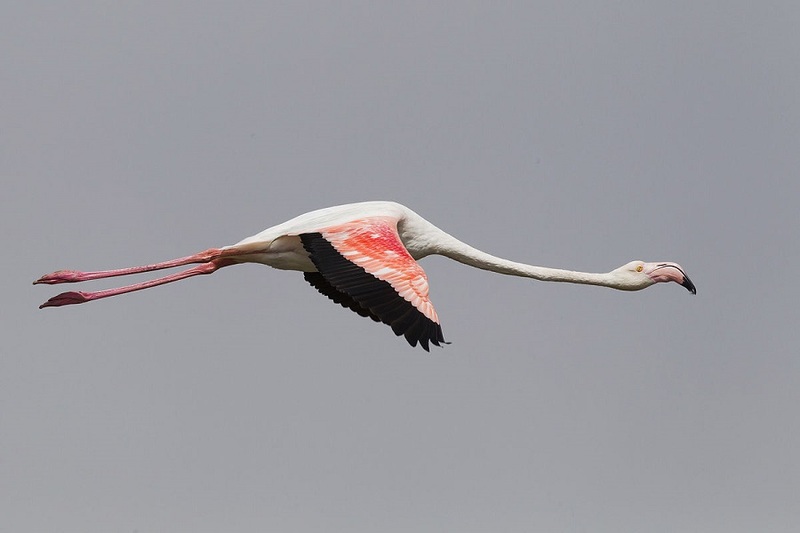 Flamingos sometimes hang around at Akrotiri Lake near Limassol, even after winter has passed. 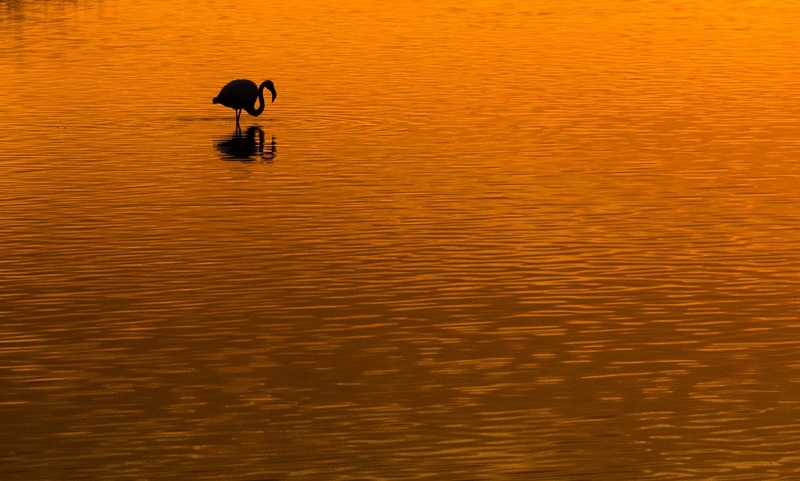 Another favorite flamingo haunt is Limassol Salt Lake, also known as Akrotiri Lake. It is the biggest lake in Cyprus, although it remains remarkably shallow; its deepest spot is only 3 feet (1 meter) in winter, while in summer it’s all dust and a shining white salt crust. Between 2,000 and 20,000 flamingos call it home from November to March. Akrotiri is the only lake in Cyprus that enjoys the company of (at least a few) flamingos all year round, because it doesn’t completely dry up in summer. Fun fact: Two years in a row – in 2015 and 2016 – there was a black flamingo visiting Akrotiri Lake, so keep your eyes open for this unusual guest. 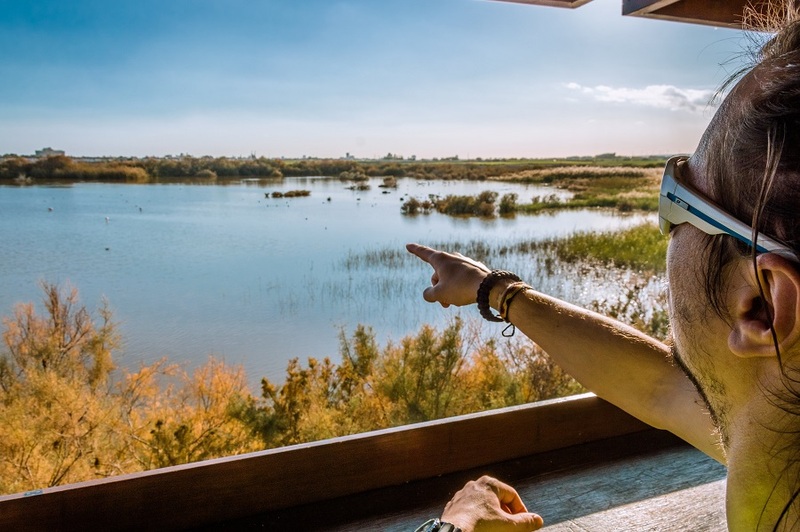 This was pure chance; just half a mile from our seaside hotel near the village of Oroklini, 10 mi (15 km) from the center of Larnaca we came across a roadside observation hideout, where we could admire Oroklini Lake’s feathered inhabitants without disturbing them. How to make it better: Plan to visit the lake shortly before sunset. The soft light and the bright colors of the sky set the perfect background for flamingo-spotting. 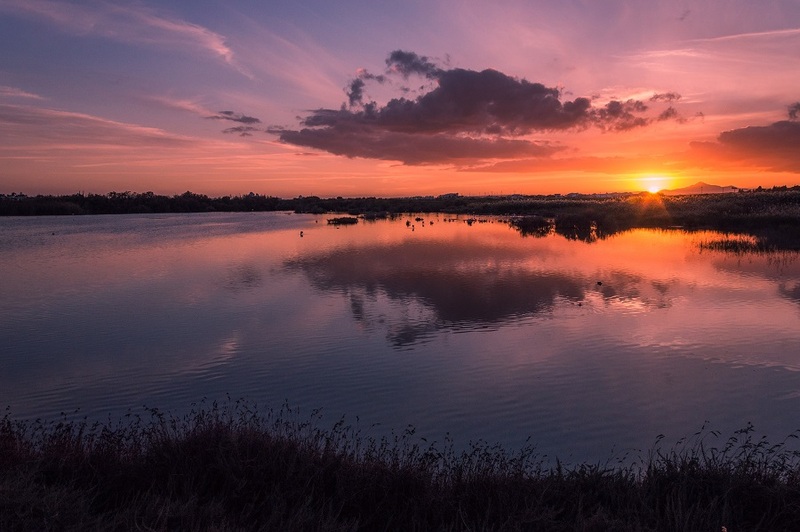 The salt lakes are protected areas – don’t litter, chase the birds for a selfie or interrupt their life in any other way. Bring your long-focus lens to shoot better images.